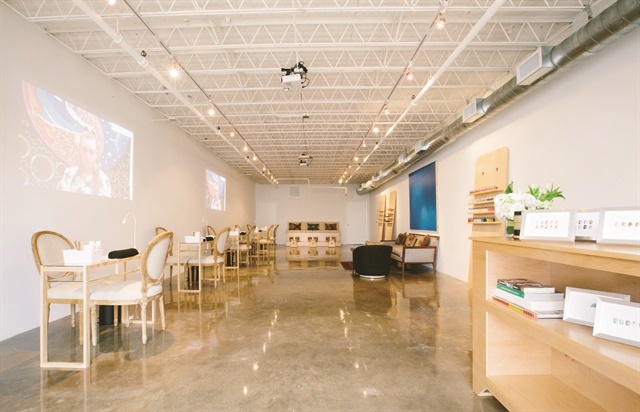 Vanity Projects, founded by Rita Pinto in New York in 2013, is an elite nail salon-meets-art gallery. It hosts international nail artists through its artist-in-residence program and offers customized services. With the aim to create a dialogue within the culture community, Rita curates video art programming by established contemporary artists at the space. Vanity Projects opened a second location in Miami in 2015 and looks to further expand its footprint. What is your background before founding Vanity Projects? I’m originally from San Francisco, but I went to school in England, so I grew up in Europe. My mother owns a gallery so I have always been interested in the art world. After I got my master’s degree in England, I came to New York and worked as an independent art curator for 5 to 6 years. During this period, I also worked on marketing and advertising for art museums at LaPlaca Cohen, where I learned there were more façades of the art business. Branding really attracted me because of the idea of having an identity based on nuances such as fonts and texts. I thought there was definitely some creativity and power in terms of the messaging and how it made us feel. Then I started working on brand experience at FutureBrand around 2004, when people just started doing brand experience. All of these are the subterranean levels to Vanity Projects. The financial crisis in 2008 was an awakening for me. A lot of wealthy collectors, even though they might have not been affected by the economy, became very conservative in their spending because so many people lost their money. It had some immediate ramifications in the culture field, as we were not making commissions on sales at exhibitions. I thought that wasn’t sustainable long term. A lot of my peers started opening small galleries on Orchard Street, and I thought they were so brave to open up these places, but I didn’t want to do that. What else could I do? So I had the idea of Vanity Projects, and from 2008 to 2013, I was still working as a curator, selling artworks, and doing consulting, while doing research and getting my money together. I was working on everything that I could do backend without a brick-and-mortar store, such as designing the logo and making the website. The art gallery monikers usually consist of someone’s name or the location and galleries or projects, so I adopted projects. I was not interested in using my name, and at that point I didn’t have a location. I chose vanity because it is a play on words. A vanity project literally means we are doing something for the sake of looking good, and the irony is that we actually are. I don’t want to open a nail salon that exists just as a nail salon. I want to elevate it. We have an artist-in-residence program where we invite artists from all over the world to our space. It brings in a lot of energy to the space because for each of the artists working here, they are constantly being inspired and motivated. At the same time, we live in this world where art, fashion, media, and lifestyle have all morphed into one another, so that’s why a concept like Vanity Projects boarders on that kind of crossroads between them. The video programming is part of the culture context here. We want our customers to engage in something because these manicures take an hour and half to two hours. How did you prepare for the opening? When I first told the idea to my peers and collectors, they thought I was crazy and didn’t support me at all. Some of my dear friends did. They would come to the pop-ups I hosted at places such as rooftops and offices. I did a lot of pop-ups. One time I even rented a huge luxury tour bus to an art fair in Hudson, New York. I projected videos and did manicures on the bus. Then I did a huge pop-up at MoMa PS1 from January to March in 2013, and I felt ready after that. You had no experience in running a nail salon. How did you figure out what you need for it? I went to a nail school in 2010 and got my license, so I knew what supplies I would need to order. The government website also gave guidelines on what I need to do in order to set up a nail salon. We have a formula for pricing based on the products, time, and the artists. We also gauge based on our competitors. We don’t want to be too much more or less expensive than them. We also do a lot of customized nails, so the price is always changing. When did you decide to open a physical location and how did you find the location? It has to be a Manhattan address because I really want Vanity Projects to connect to things that are high end. I worked with a local Chinese realtor and looked at different locations for two years. How did you decide the interior design? I designed everything by myself. I want the salon to have a cool, clean, and classy vibe. The artworks on the walls are part of my personal collection. How did you put together the video programming? I would go to artists, galleries, museums, and foundations and request to borrow the works, and they give me permission and send me the files. I would then compile them. It’s an easy ask because I could get pedigree works without taking someone’s inventory in the same way that I would about paintings. In January 2017, I actually decided to partner with this amazing British organization called Daata Editions. They actually commission artists from all over the world, and the artists are really established with great pedigrees. It always folds back into our culture cachet. That’s how we can maintain Vanity Projects as an elite nail salon. It’s more of an atelier. But I’m not using that word in a marketing standpoint. I’m using it because that’s really what we do. How often do you update the videos? Every four to six weeks. The clients usually come in every two weeks. If they see the same programs more than twice, they become repetitive, so we’ve been changing them closer and closer. It used to be every six to eight weeks, but that was too much. The videos are short, so you really see them multiple times. For the first couple of times, you only see the textures and don’t really connect to it, but once you sit here and look up the videos, they subtly give you that influence. So when you go to museums next time, you would take a moment to watch the videos because you are accustomed to it. Why did you decide to open a second location in Miami in 2015? We did a lot of pop-ups in Miami as well such as Miami Swim week and Mara Hoffman runways. I also went to Miami every year for Art Basel. Then I met these local nail artists, and they said I should open Vanity Projects there because there was nothing like that, and they would love to work for me. So I said let me come back when it was not Art Basel and figure out what Miami would be like. I went and realized it would be an opportunity. It was a risk but a calculated risk. I only had about $20,000 budget for that, so I opened the location with $20,000 budget. How is the Miami location different from the New York one? It has the same set up as the New York location. The interiors are different because of the different space, but it has the same aesthetics. We have an amazing but different audience in Miami. Women there care more about fashion, beauty, and lifestyle. We can do edgy Lower East Side in New York, but we can’t do edgy Lower East Side in Miami. We have to do luxury in Miami. In order for me to maximize the opportunity in Miami and take Vanity Projects to the next level, we opened in the new Paradise Plaza in the Design District, which is a luxury development. We are next door to Gucci, Chanel, Prada, etc. It just adds a whole new level for me in terms of where this brand is going. I also moved down there as well because I think New York is the creative seed, but Miami is where Vanity Projects can develop and grow. How did you find the nail artists? That’s the hardest part of my job. I’m always looking for talent. I approached them the same way that I approached artists. I would do studio visits aka getting a manicure, and I would email them and ask them to come. Who was the first person, besides the nail artists, that you hired and how did you find that person? At first I had unpaid interns, then I hired them. They grow within the company, and I can pay them more when they are offering more and when I can afford more. Who is on your team now? When we first opened, there were 4 nail artists. Now we have an operations team based in Miami. We have 7 people managing the salon, 13 artists in NY and 8 artists in Miami. I finally had my money together after I sold an artwork and made a huge commission. I also didn't wait until I could get a certain amount at once to get things off the ground. I did things parts by parts. So for example, I had $2000, so I would pay for my website and logo, and I had another $5000, then I would do a pop-up. It’s really grassroots marketing because we have no budget for marketing and advertising. Instagram and our website are very important platforms for us to showcase the artworks and get the messages out there. How did you generate press? We always invite the press to the salon as well as our events. Were there a lot of people coming in when you first opened? Not at all. It took three years for people to start coming in. Most nail salons already had their loyal clientele who wouldn't come to our salon, so we needed to find our clientele. How do you manage the competition with other nail salons? I don't think I'm in competition with them. There are so many people in New York. We are all fully booked. What we do is also very high end and technically challenged. People can come in with any inspiration, and our artists can execute them. Whatever you do is going to take its own shape. I have built a platform and created a framework for that platform, but it has its own life. I make sure not to micromanage. Be prepared. Do your homework. Know exactly what you’re doing in advance. Be patient with your business. Dedication and commitment are really important.